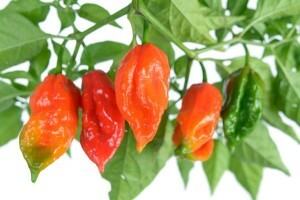 Also known as ghost pepper, ghost chili, U-morok, red naga, naga jolokia and ghost jolokia. Legendary variety, one of the world's hottest peppers, with readings in excess of 1,041,427 Scoville units! In 2007, Guiness World Records certified that the Ghost pepper was the world's hottest chili pepper. Originally developed in the Northeastern Indian States of Assam, and Nagaland. Climate has a considerable effect on the heat of these peppers, the spiceness decreases in more arid growing conditions. Start seedlings 2 months before last frost.